Many parents often times struggle with the decision to send their students to smaller or larger schools. Both can have a number of benefits. Here at The Apple Tree School in Houston, we believe that smaller class sizes are the winner in the argument. This is especially true for the younger years that are very formative. 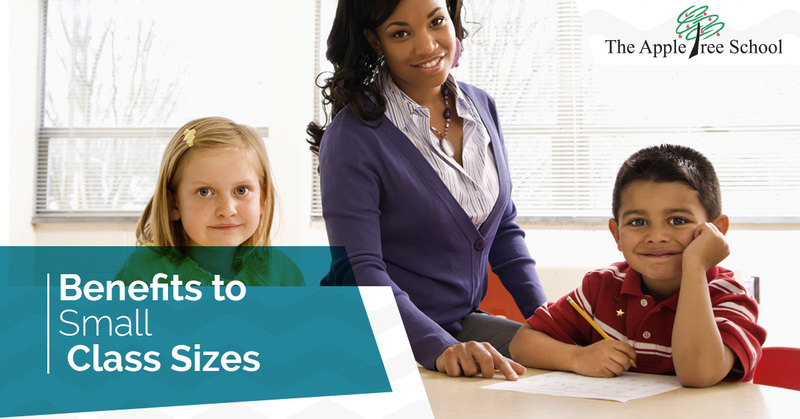 In today’s blog, we’ll be discussing the big advantages and bonuses of smaller class sizes. If you are looking for a wonderful Christian school and center of early childhood education in the Houston area, call us at (281) 606-0698 or contact us online to learn more! When your student is lost in the weeds of a large classroom, it’s easy for them to fall behind and miss out on the attention that they need to really succeed or to get back in the race. As they fall behind, it’s common for students to lose their interest in the subject matter or have negative self perceptions reinforced. These perceptions can easily develop into later self-esteem issues, and have long-lasting and, at times, permanent repercussions on their performance and behavior as they continue to develop throughout their life. Students in smaller classes get a lot more contact with everyone in their class. This leads to greater interconnectivity and allows for the development of truly strong bonds. As students continue to move up in grades, year by year, they continue to know those around them, helping further reinforce their friendships. One of the greatest parts of small classes is the ability of each child to input ideas, give feedback, evaluate ideas, and participate in discussions. This is why many of the greatest teachers only took on a handful of pupils. Not only is their individualized attention from the teachers, but there is an increase in the children’s participation and ability to individually express their ideas in a class. When this input and feedback is given in smaller classes, children’s ideas have a far greater amount of time to be discussed. This advantage helps children see their ideas as valuable, be able to give feedback, and to also appreciate when they receive it themselves. Not only do small class sizes assist the students, they also help the teachers. Teachers with smaller classes can teach far better for a number of reasons. One of the most important is that teaching small classes gives a teacher more preparation time. When new lessons need to be planned or gone over almost nightly, on top of grading, every minute counts. The time of a teacher is precious and that ability to focus on more pressing classroom issues is key to great, balanced teaching and a healthy classroom. Smaller classes help the teacher keep order simply due to more engagement and less students. Less students mean that each student is more accountable. With more order and engagement, more time and energy can be put into lessons and the individualized attention that children need to thrive. Research has shown that from elementary schools through universities, student performance is higher with smaller classes. The reasons above speak for themselves, but study after study has come to the same conclusion. Better grades and skills mean a better foundation in an increasingly competitive world. This foundation will help your child become the best version of themselves that they can. We advocate for smaller class sizes regardless of where you send your child. If you are interested in a classically focused education at a small Christian school in Houston call The Apple Tree School at (281) 606-0698 or contact us online to schedule an appointment or ask us questions. We are non-discriminatory and offer our education services to any child.